10 Years With Style - We made it! I can’t believe it! We are officially 10 years old. We made to be 10 Years With Style!! 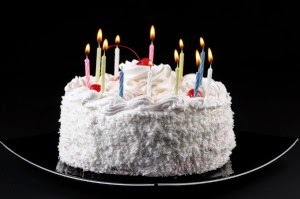 What a honour it is to announce our companies’ birthdays. In some ways it has felt like it happened in a blink of an eye, yet looking back and going over the memories is puts me into a state of awe of all the ground we have broken to get to this point. Our humble beginnings where nothing more than Jorge and myself looking at each other and saying, “So are you ready?”… us plugging our noses, and jumping into the deep end! I personally have been doing travel for wow… 19 years and counting? But these past 10 years have been full of sweet successes and a few bitter learning hurtles. Every one of them ending with a happy ending of course! 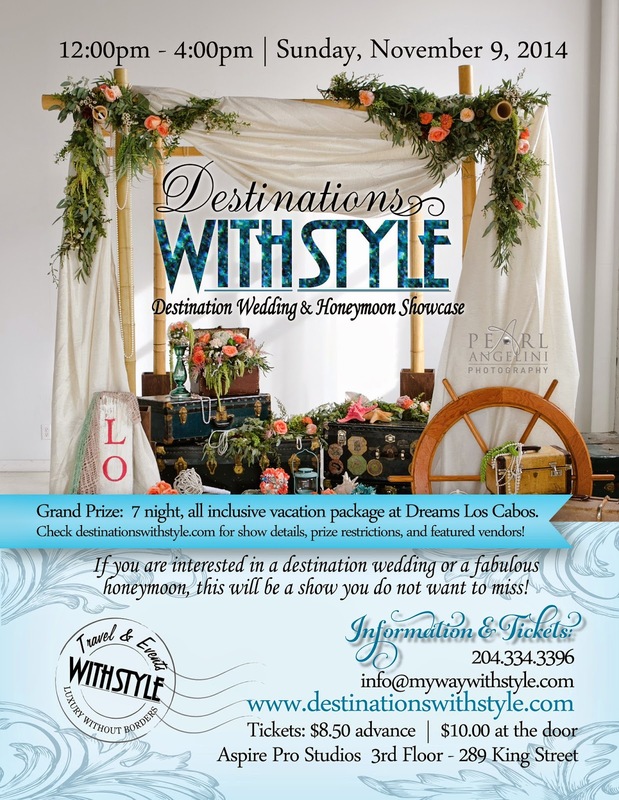 When Travel & Events with Style was created, the goal was to merge the love of travel with weddings. Destination Weddings where starting to grow and to have a firm that offered the travel agency and the wedding planner firm under one roof only made perfect sense. As time went on, we as a company started to notice the areas of challenges for our couples. We then added services such as Officiant services to be wed prior to departure, wedding invitations, wedding websites, and really, the list always seems to grow.. we now even have fitness?! And a destination wedding magazine, book and bridal show?! What?! We are pinching ourselves! We can honestly say that when a service is added on, we educate ourselves in that area to offer our guests our very best. The best part of passing this 10 year milestone is that we have now have had the chance to grow our relationships with amazing suppliers around the world! One thing we have always strove for was to keep our company couture and boutique. The only way to offer service that is beyond status quo is to keep the quality with hands on, personalized service. To everyone who has stuck by us thorough these years, to every client that has honoured us as being our guest, and to everyone we have met along the way, I Jorge and I want to say, Thank you. It is a blessing we are here doing what we love and YOU all where a large part of it! It's back! It's almost time for our wedding show! This one you do not want to miss. More vendors, more inspiration and a grand prize for a trip for the bride and groom to Dreams Los Cabos (some restrictions apply). Check out our show's website at: www.destinationswithstyle.com. It will have the all details including how to buy tickets, where to go, and what you will see. One of perks of our job is to experience travel so we can report back to our clients. I know, touch job, right? Well, sometimes it is. Sometimes.. well, I am sure you do not feel sorry for us. Our most recent adventure was experiencing VIA Rail. Not just the usual economy or business class seats, but rather the full across Canada feel. We wanted to see what the sleeper cars and meals where like. One thing that enchanted us about travelling the train was how the train makes time stand still. Starting in our glorious stations (Well.. if you can look past all the renovations of course. It will be backing its glory soon) it makes you feel like time gone by. Getting on the train in the 1930’s, 40’s, 50’s… We looked forward to the quiet mode of transportation. It seem like a great way honeymooners or even families could travel and enjoy the travel side of the experience. Be warned, I will be honest about my experience. To start off we saw our limited schedules so we chose only to run away for the weekend to Toronto. 2 nights on the train, a full day in Toronto and then back on that night to have 2 nights again on the train. A little bit of an Amazing Race, maybe, but we are in Toronto regularly so the novelty was the train for this particular trip. Our adventure began a Thursday night. What enticed us was that the train left late in the evening. It allowed us to complete our work days without stressing about missing it since it left late in the day. It was of course late leaving on top of the late departure, but to leave at night, sleep threw the night and be half way by the next morning was very enticing to us. One way down to Toronto there was limited space. Our best option if we wanted private sleeping arrangements was to book 2 single sleeper cabins across from each other. My first impression is.. “What did I do? !” .. The single sleeper in one of the older cars was beyond tiny. I am shorter person to begin with but for my knees to almost touch the toilette and see the “drawer bed” as my kids affectionately call it after seeing it. It was too tiny for my taste. The toilet was placed in the center of the room, in front of the picture window. To say the least, it as awkward. When the bed pulled out, it covered the bed and made for an awkward time in the middle of the night to go to the washroom. My take on it all you ask? I do not recommend the single sleepers and recommend people pay the upgrade to the 2 bedroom sleeper! Splurge and get the 2 person sleeper. Even if you are alone and travelling! Our meals where included in the ticket price as well as basic drinks (juice, coffee and tap water). Every meal had 3 options for dietary choices. It usually included a beef option, chicken and vegetarian. This really was wonderful. Jorge enjoys all food types and I haven’t eaten red meat (by choice) in over 20 years. I wasn’t sure how that would be, but all in all we really enjoyed the meals. Not gourmet, but they where delicious. The service was good too. From hostess to waiter. They worked long hard hours and somehow always had a smile on their faces to greet us. The train schedule took a little getting used to. By schedule I mean meal times and activities. With getting on later in the week in Winnipeg we only had the option for late lunch and dinner the next day. I am glad that they day after we where able to choose. Breakfast is served 3 times. It starts at 6:30am and then every hour. They have waves of 3 in order to fill the dinning room and service the courses at once. Not like a fast food restaurant where you can saunter in and go when you wanted. We learned very quickly you get up for the 6:30am breakfast. It’s easy enough to nap after, but to get in later is close to impossible. The lunch times are 11:30am for the early (and then 12:30/1pmish and again 1:30/2pmish). Dinner starts at 5:30pm and the second serving is usually at 6:30/7pm and last is around 8:30pm. Lunch and dinner has to be prearranged on the time of service. Again, something we learned very quickly or went hungry. The Sky viewing car was by far our favourite! So picturesque. Day or night, there was something to enjoy. The next car was always the activities car. This had board games, light snacks and coffee and was there area we enjoyed a few beer and wine tastings. Again, it was all on timing or you missed the fun things! Our time in Toronto was limited, but perfect! We arrived at 10:30am (an hour late). We dropped off our luggage in storage and took the day to site see. Checking back in at 9:00pm at night was just the right time. About the time we would have if we called it day if we stayed in the city and had to sleep at a hotel, but this way, we where IN our hotel travelling leisurely home. On our way home we stayed in the 2 person sleeper. It was in a new car, and all I can say was, “WOW! !” we loved every minute of it! Private room for toilet this time, 2 bunk beds and ROOM! Well, in comparison to the single sleepers. I am so glad we ended on a positive note otherwise I would never right my recommendations. From that point on it was wonderful! So wonderful that our sleep deprived bodies decided to sleep through breakfast and let the gentle rocking of the train lull us to bed. With lunch being at 11:30am we didn’t even noticed we slept for 10 hours. It was the room! It was lovely. Our arrival back into Winnipeg was at a great time. It was at 8am. It allowed us to be ready to start the work day on the Monday. And we did just that. All in all, if you have guidance from your travel agent, I DO recommend the sleeper cars on VIA Rail. We are already planning our trip the other way into the mountains with the whole family. Over all was a great experience and great idea for honeymoon. Thinking a Winter 2016 Destination Wedding? Is it Too Early to Plan if I Start now? Recently, even more so than usual I have been asked, “ Is it too early to start planning my 2016 winter destination wedding?” They all seemed prepared for me to “yes” and are genuinely surprised when I actually, “No! Actually we have quite a few couples contracted that are already with us starting their wedding planning. The interesting part is that most couples have first gone to another travel agency, and have been told it is too early. You can’t blame anyone who asked around and went to a family friend right? Most travel agents wouldn’t think of going this early to start the destination wedding.. well, we are not your typical travel agency are we? Now the reason for my reply that it is not too early simply is that we have added a services to guide you by the hand to START the RESEARCH before even pricing the travel and wedding planning. Personally, I LOVE how couples are being more cognitive of their incomes. Whether you can afford something or not, why are you going to spend it all at once without a quality decision? If you asked me, I know I would be honest and say I do a LOT of research before I buy most things, so it only makes sense that wedding needs this much care. What we have done is added a few facets to our wedding planning package that now allow couples to dig deeper than the surface to find the best wedding location FOR THEM. Price or not, please, please, please do not just choose your location based on price. How are you going to be happy? Honestly, if you choose a location because “it is cheap”, well let’s be honest, you may really get “cheap” in the end. Or what about the most expensive? Why would you pay for a top dollar resort when it really does even suit you as a couple? My suggestion is meet with us. Talk with us. THEN let’s see if we should start a wedding planning package that helps you research before we hand over your hard earned dollars to travel companies and resorts. Taking this extra step will really give you that peace you made the most informed decision you could. Note we have many packages now for destination weddings and we really can adjust them for you. Can you call us up and ask us how much? No, and we will not answer you over the phone. Are you shocked I said that? 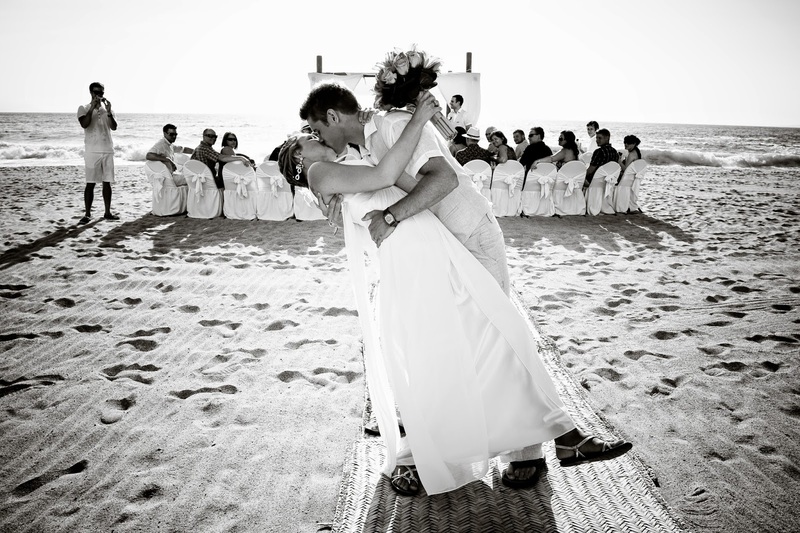 If so, I am sorry, but we would not be one of the most specialized companies for destination wedding if we did? We need to tailor it for you. 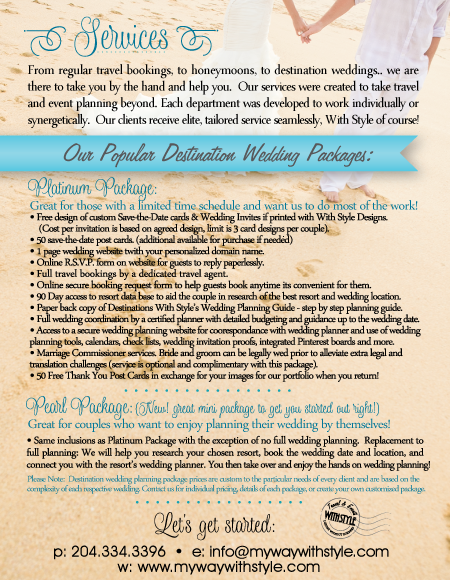 Below are 2 most popular destination wedding planning packages. The first is our most inclusive package the Platinum Package. This is best suited for those who really need us to take you by the hand from start to finish. We don’t limit our time to plan your wedding. It is start to finish! The second is our newest package called our Pearl Package! It is our mini package. It is really great as it is half the price of the Platinum but is covers all the important bases. The most important part is that is covers the research help. You have 90 days access to a resort specific data base to learn about the different resorts in detail. Once you are ready we can price, narrow it down and we will then get you the information on the wedding packages, connect you with the resort planner and secure your wedding date and location… THEN you can take over. This is the best package for couples who really want to plan themselves but have no idea how to start. Sometime it is not just that you don’t know who to start, rather WHO DO YOU TRUST to be honest. So read this over, and call or email us. Let’s talk. Let’s make your wedding your best day thus far, and most it the way YOU want it. Instinctively, we are often motivated by highly advertised low priced holidays. Remember, this is your wedding. You will want to find a balance between low cost and high quality. Even though you want to shop around for the best price, try to find out at the beginning if you think you will have a good relationship with your destination wedding travel professional. You are planning a wedding, you will want to work together as team to make your day unbelievable! Salud to Your Future & Your Wedding! Another trip, another FAM to open us up to new locations and resorts. This last trip was to Puerto Vallarta and we stayed at the Barcelo Puerto Vallarta. The Barcelo Puerto Vallarta is definitely a resort that will fit well with some and not others. For us, as a family it was wonderful! We had the time of our lives and I would definitely recommend it to others. The Barcelo is a little off the beating path from the other resorts. It is one of the furthest resort South of the strip and a good 45mins from the aiport and downtown. This makes for a great hideaway, but not for those who would rather be right in the city to walk and talk to the locals. Personally, I love that we where far and away. It was a perfect location for a retreat. The kids program there was lacking if you wanted to drop them off at the kids club, but if you didn’t mind staying with the family then you really would love every minute. We had the privilege of staying in the Presidential Suite. Was it worth paying the upgrade? YES! The deck was absolutely amazing as it wrapped around 3 sides of the ocean front building. No disappointment there at all. OK, maybe one.. we had to go home after the week and wanted to stay forever. The cuisine had a lot of variety. We tried the room service and they where attentive and the food was hot and cold as it should be. No complaints. I found the food very decedent and I think we may have eating our weight in avocados and papaya. That alone would be an extra star rating in my heart. As most resorts, there was a themed night every night and the entertainment was great. Our stay landed on Carnival and the entertainment that night was outstanding! We where very happy over all with that. Everything was off at the resort outside at 10pm. To be honest, it wasn't bad. You simply just had to choose a place in doors to continue and it the kids sleep great. There was not a night club on the property though and with the exception on a shack down the beach, there really wasn't anything near by either. For wedding locations, it was quite nice, though I am not sure if I would recommend a beach ceremony in the month of March. The tide is high that time of year, but I have heard it boasts long beaches as it get closer to the summer months. The courtyard and deck around the pool where great locations to consider however for a wedding reception and the garden for a ceremony. Both great alternatives and most (with the exception of the garden), looks out to the beautiful ocean. One item to note for couples: this resort does not allow wish lanterns. If that is important to you, then this may not be the place for you. If I had to rate it, I would give it is a solid 4.5 Stars. There where a few items lacking, but it made up for it with the service and price. Yes, the price, it was amazing! Great deal for sure.